The burner shell condition could be considered in excellent condition if the superheater ring were being the standard of measurement. Mounted directly to the underside of the boiler, the superheater ring is only a few inches thick; just thick enough to enclose and hold the superheater. The superheater is length of heavy walled pipe that is looped just beneath the boiler that the steam passes through on its way to the engine. By superheating the steam additional heat energy can be applied which increases the efficiency of the steam engine by as much as twenty percent. 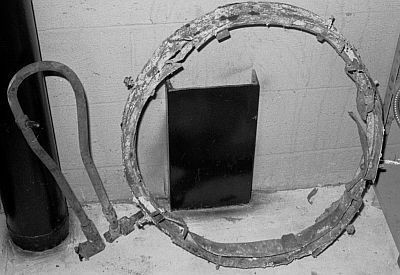 As the photograph shows, the superheater ring had really started to deteriorate. The superheater ring is actually of a double-wall construction similar to the burner shell. Most of the insulating materials were gone however once the burner had been cleaned of any asbestos insulation the superheater ring would be placed in the same clear plastic bag and cleaned as well. The steam line expansion loop in this photo is located on the back side of the boiler just in front of the firewall. Looking like a wish-bone, one end of the expansion loop is connected to the superheater while the other end is connected to the steam line that runs to the rear of the car. This expansion line had the original Stanley fittings on the bottom of it and they were so corroded and rusted that it was necessary to cut the expansion loop out. The expansion loop also provides a place for steam cylinder oil to be injected into the steam supply for the purposes of lubricating the engine. Due to its condition a new steam expansion loop would need to be fabricated. Originally probably insulated with asbestos, this loop was insulated with wrappings of automotive manifold insulating tape and furnace cement.